It all started with The Decision, the hour-long television special in which LeBron James fled his home state Cleveland Cavaliers to “take his talents to South Beach” and become a member of the star-studded Miami Heat. Playing alongside fellow supervillains Chris Bosh and Dwyane Wade, LeBron James won MVPs and NBA titles, and made it to other NBA Finals appearances in a pretty short and successful span playing for Pat Riley and company’s Florida franchise. Now, after losing to the Spurs, it looks like that Big Three is going to become the Big None as two signees appear to be headed elsewhere. Chris Bosh is rumored to be signing with Houston. Dwyane Wade is broken down. 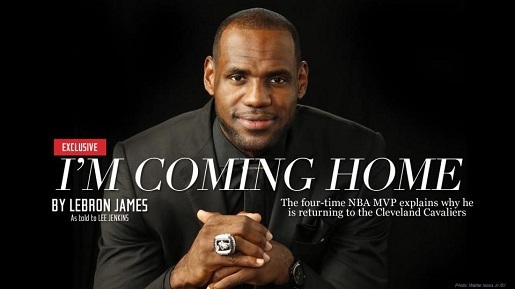 As for LeBron James, he’s going back to Cleveland. “To make the move I needed the support of my wife and my mom, who can be very tough. The letter from Dan Gilbert, the booing of the Cleveland fans, the jerseys being burned — seeing all that was hard for them. My emotions were more mixed. It was easy to say, ‘OK, I don’t want to deal with these people ever again.’ But then you think about the other side. What if I were a kid who looked up to an athlete, and that athlete made me want to do better in my own life, and then he left? How would I react? I’ve met with Dan, face-to-face, man-to-man. We’ve talked it out. Everybody makes mistakes. I’ve made mistakes as well. Who am I to hold a grudge?” wrote LeBron in a letter published by Sports Illustrated. The letter linked above is wonderful, and I recommend you read it. It really goes a long way towards rebuilding LeBron’s reputation and helping redeem him in my eyes as a person who is doing what he feels like is the right thing to do, not just for his career, but for his family, his neighbors, and himself. The prodigal son of Akron, Ohio returns.